My mind often goes back to Silver Lake State Park in Hollis, N.H., as a warm, safe summer place. Never to be confused with large, spectacular New Hampshire landmarks like Lake Winnipesaukee and Newfound Lake, Silver Lake pleased with its small, family-oriented beach presence. I remember proudly swimming out to the wooden Silver Lake dock soon after passing my advanced swimming lessons. The concession stand with its dark brown wood structure and neon green awning offered comfort food that always hit the spot on a hot summer day. The unforgettable smell of burgers on the grill pretty much permeated the football-field size of the beach, while the cheap, inferior-tasting ice cream did its job by cooling us down. The picnic area up the hill from the sand might have brought about too many insects, but also provided shade from the bright sun. The big green field near the entrance provided the perfect spot to throw the ball around with dad and my friends who tagged along for the trip. Many of the seasonal homes across the lake looked like places I would like to someday live during the summer. The occasional turtle venturing onto the sandy beach provided novelty and, metaphorically, as a reminder to slow down. After all, Memorial Day to Labor Day Weekends traditionally went by at an unfair speed. We needed to enjoy every summer moment before hitting the books and knowing the five-day work week would be here sooner than anticipated, according to my dad. As a kid, Silver Lake seemed like a place that only existed during summer. In my dreams, Silver Lake State Park disappeared after Labor Day Weekend. Not too long after I earned my driver’s license, however, I had to drive up to Silver Lake in late September to see if the place did indeed exist. Of course, Silver Lake never went away, unlike those childhood dreams that suggested otherwise. Silver Lake seemed unremarkable, beyond summer. Those hot beach days gave way to a cold gray chill and not one person on the beach. In a way, Silver Lake State Park did disappear after summer. Not too long ago, I took a drive past Silver Lake State Park with my family and saw a different personality that, in its own way, acted every part of the glorious summers remembered. 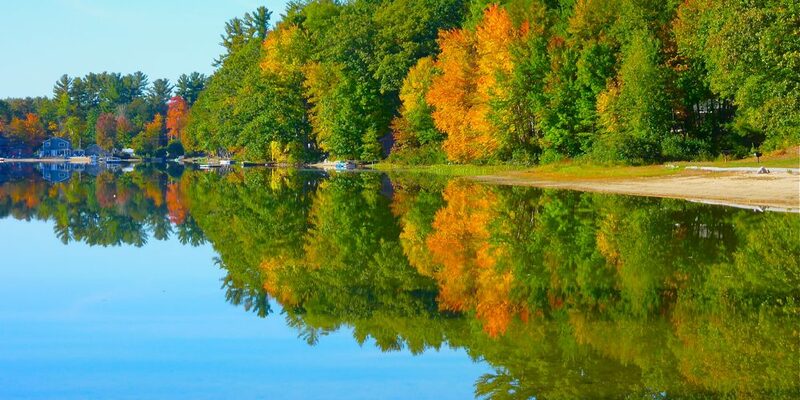 Fall foliage burst with colors in the trees and a brilliant reflection on the lake. A few people in fall jackets leisurely walked the beach with their dogs, perhaps suggesting that Silver Lake might be even nicer in autumn with fewer crowds and a crisp feel in the air. I will never forget this unobstructed scene and experiencing it with family. This scene had to rank among the best fall scenes in New England. Thinking more about the changing seasons, though, Silver Lake never lost its friendly, unpretentious personality. That also includes winter with its icy look and spring as the rebirth of life in New England. The climate of a lake might change by temperature, but the setting remains wonderfully constant. Like a good book or every day living, Silver Lake resonates with different chapters to be celebrated. The memories and dreams, in retrospect, can be made any time of the year. Silver Lake is located at 138 Silver Lake Rd. in Hollis, NH. Tel. 603-465-2342. Stay at the Crotched Mountain Resort in Francestown, N.H., about 40 minutes from Hollis.